The object Messier 73 (M73, NGC 6994)) is a little conspicuous assortment of four stars of 10th to 12th magnitude, situated in the very western part of constellation Aquarius; its nature as a physical group is doubtful. It lies only about 1.5 deg east of globular cluster M72. "Cluster of three or four small stars, which resembles a nebula at first glance, containing very little nebulosity; this cluster is located on the parallel [of declination] of the preceding [M 72]; its position has been determined from the same star [Nu Aquarii]." Apparently, this group found its way into Messier's catalog because he had determined its position at the same time when measuring M72, which is 1.5 degrees to the west. It may have been included because of its "first-glance nebulous" appearance in Messier's instruments. Although it is clear from this description that this group was what Messier had observed and measured, some versions of Messier's catalog omit it as an "obscure" object. However, John Herschel has included it in his General Catalogue as GC 4617, and J.L.E. Dreyer included it in the NGC catalog as entry number 6994. Consequently, this object has received little research interest. Collinder (1931), who cataloged it as Cr 426, estimated its distance at 12,000 light-years, and from its 2.8' angular diameter, speculated if this was an open or a globular cluster. It was also cataloged as C 2056-128 and OCL 89 in more recent catalogs of open clusters. Ruprecht (1966) classified it as of Trumpler type IV 1 p, i.e. a very sparse and poor open cluster which is not very well detached from the surrounding star field. Wielen (1971) considered it as doubtful, but classified it as an old and nearby cluster. What remains to clear up to now, at least to the knowledge of the present author, is the check if the 4 stars in M73, or at least some of them, are physically related. There was always a great fraction of astronomers who believed that M73 is an asterism, a chance alignment of 4 stars at different distances, but it would certainly be interesting to know if all or some of the 4 stars form a physical system of some kind. As Kenneth Glyn Jones states: "This issue is perhaps a minor one, but every student of the Messier catalog would be much interested in the outcome." "[The authors] suspect in fact that M 73 might be a real little cluster, for the following reason. On average there are 60 stars per square degree which are brighter than magnitude 12, as are the four stars of M 73. The probability of finding four such stars by chance in a given area of sky one arc minute across (like M 73) is about two chances in a billion. However, there are 150 million such little areas on the sky, so the chances are only one in four that such random asterism exists on the sky. M 73 could be it, but we would gamble that it is a genuine multiple star of some kind." ESA's Hipparcos satellite has obtained measurements for the parallaxes of two and for the proper motion of all four stars. Giovanni Carraro of the University of Padua, Italy has tried to determine distances from these data, and gives values of 137 and 440 and light-years for the brightest star GSC 05778-00802 and second-brightest HD 358033, respectively (Carraro 2000, see also Sky & Telescope of July 2000, p. 26). Unfortunately, these results are of limited value only, as the famous and otherwise extremely useful Hipparcos database has turned out to contain systematical errors like nonsensial negative parallaxes, particularly for closely neighbored stars, and therefore does not help very much in issues like this (a note in S&T of October 2000, p. 20 coincides with our notion). h  m  s    deg  '  "
where the data are: Their star number, position in Right Ascension (RA) and Declination (Dec) for 2000.0, apparent V magnitude, and B-V color index. These colors show up conspicuously in color images obtained with larger telescopes, like this KPNO 0.9-meter telescope image. The authors investigated another 140 stars in the region of M73, and identified a total of 24 member candidates, including the four stars of M73. These candidates can be fit into a color-magnitude diagram of an old cluster of age 2 or 3 billion years. They obtain an estimated distance of this presumable "cluster remnant" at about 2,000 light-years; this would place the four M73 stars as bright, evolved giants or subgiants, above the main sequence in the Hertzsprung-Russell diagram (HRD). Assuming them to be main sequence stars would place them somewhat nearer to us. Based on this work, Bica et.al. 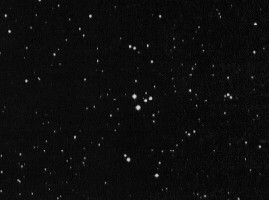 (2001) list M73 as a "Possible Open Cluster Remnant (POCR)." Looking at these data, only the values for radial velocity and distance of the first and the third star are close enough together that there remains a dim chance that they may form a physical pair, a possibility that would be made even dimmer, should their Tycho 2 proper motions be confirmed, which differ by about 10 mas/yr (milli arc seconds per year), corresponding to about 30-40 km/s at the estimated approximate distance of 2,500 light-years. The present author [hf] tends to feel that it would still be hasty to finally close this issue. Reasons are, first, the limited usefulness of the Hipparcos data used to make the Tycho 2 Catalog. Second, Odenkirchen's and Soubiran's valuable spectroscopic work was evaluated by kind of black box software to estimate absolute magnitudes, and thus to derive distance estimates. Third and perhaps most important, the observational data in the different investigations are still spread considerably; consequently, e.g. the derived distance values for the four stars are correspondingly uncertain. Therefore, there is still an obvious need for more and hopefully even better data; even the basic data of these four stars, e.g. their spectral types, might be improved (or confirmed). As the information belongs here, please send us any additional information (including pointers to it) you find ! 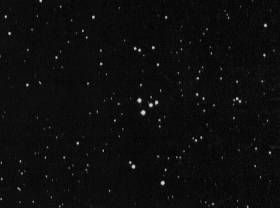 This "Y"-shaped group of stars is well visible in 4-inch telescopes; the fourth star is notably fainter and difficult in these instruments. It is best found from M72 which is almost at the same declination (very slightly North) and 1.5 deg West. The 4.5-mag star Nu Aquarii, mentioned by Messier, is about 2deg North and 1.5 deg to the West. East of this star (and not far from M73), the Saturn Nebula (NGC 7009) can be found. To the southeast of M73 is a collection of faint galaxies, the brightest of which is IC 1344 at visual mag 13.7; about 1.5deg E and little N is equally faint (13.7 mag) NGC 7010. L.P. Bassino, S. Waldhausen, and R.E. Martínez, 2000. CCD photometry in the region of NGC 6994: The remains of an old open cluster. Astronomy and Astrophysics, Vol. 355, p. 138-144 (March 2000) [ADS: 2000A&A...355..138B] also see [Preprint: astro-ph/0001238]. Kenneth Glyn Jones, 1991. Messier's Nebulae and Star Clusters. Second edition. Cambridge University Press. [ADS: 1991mnsc.book.....J] [First edition published by Faber & Faber, 1968). The M73 remark is on page 229 (2nd edition). Paul Murdin, David Allen and David Malin, 1979. Catalogue of the Universe. Crown Publishers, 1979 [ADS: 1979QB44.2.M869....]. The M73 story is on p. 75-76. M. Odenkirchen and C. Soubiran, 2002. Astronomy and Astrophysics, Vol. 383, pp. 163-170 (01/2002) [ADS: 2002A&A...383..163O] [Preprint: astro-ph/0111601]. Note: The two values for the declinations of the third and fourth star are printed interchanged in the preprint.